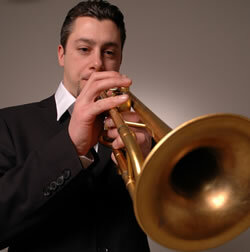 American trumpeter and composer Liam Sillery was introduced to music at an early age by his uncle, also a trumpet player. Liam considers himself fortunate to have been surrounded through the years by fine teachers and musicians. Most significant during his undergraduate studies at the University of South Florida was the great tenor saxophonist Joe Henderson. Before going on to attend the Manhattan School of Music, he performed as a freelance musician. At MSM he studied with Cecil Bridgewater, Dave Liebman, Phil Markowitz, Joan Stiles, Mark Soskin, and Garry Dial. In 2004 Liam released his first recording as a leader, Minor Changes (OA2 22020). His second cd, On the Fly (OA2 22030), recorded with the David Sills Quartet, was released on October 17, 2006. During the summer of 2007, he recorded his third cd, Outskirts (OA2 22050), with Matt Blostein, Jesse Stacken, Thomas Morgan, and Vinnie Sperrazza. On Outskirts, which was released in January 2009, Liam moved away from his traditional style to explore freer material. Phenomenology (OA2 22061), released on February 16, 2010, received a 5-star review from Downbeat magazine. In his notes, Chris Robinson wrote, "Trumpeter Liam Sillery's Phenomenology is so natural that only one word can be used to describe it: perfect. Hearkening back to the great outside-leaning Blue Note recordings of the mid- and late-'60s, Phenomenology gets better with each listen, as details and intricacies continuously come to light that were missed previously. The music's textures, rhythms and sonorities continuously morph, but not in a districting, overbearing, or contrived way. There's freedom and a relaxed ease in Phenomenology's every facet, giving the listener a sense that what is heard is the only possible solution given the group's vision. The end result is sublime." In 2006 the Liam Sillery Quintet performed for sold-out audiences in Japan. The group has played at the Cornelia Street Cafe and at Miles' Cafe, both in New York City, and at Trumpets Jazz Club in Montclair, NJ. They also performed in July 2011 for a standing room-only audience at the North Sea Jazz Festival in Rotterdam. The group's new cd, Priorite (OA2 22082), was released on April 19, 2011 on OA2 Records. For more information about this cd and the others, and to read what the critics say, check out OA2Records.com.